It had been raining intermittently all morning on this cloudy, chilly day. As, I gazed out the bedroom window to see if it was still drizzling, I saw the rain had stopped at least for now. The mighty oak tree stood naked with it's fallen leaves surrounding her on the ground. I pondered on it's humble beginnings which was started from a couple of acorns many years ago and everyone kept telling me they would not grow into a tree. Oh, thee of little faith! The mighty oak had grown tall over the years and provided much needed shade in the summer, colors galore as fall approached, held fallen snow in it's branches in the winter and housed many critters through the years. It now stood barren of her leaves, holding tightly to the raindrops that had fallen this morning before they fell to nourish soil below. It will soon enough have snow lingering on it's branches as it prepares for spring and the tiny buds of leaves with which to cloak the majestic oak in it's finery of leaves. The oak tree has provided a plethora of enjoyment, from the changing of the seasons to listening to the chirping of the many birds that choose to nest in it and watching the squirrels that scurry around the branches, playing, chattering, gathering food. It has held captive several neighborhood cats that somehow wandered into the yard. Captive, you ask? Yes, captive. Aussie, our beloved dog apparently thinks that the four legged critters that wander into her backyard playground are hers to round up. Those critters that do happen into her territory are herded and usually found in the tree waiting patiently to escape as soon as Aussie bores with the task of watching their every move. The fallen leaves from the tree have provided her with hours of play, chasing them in the wind gathering them up as if herding them, only to have a breeze scatter them and starts the process all over again never tiring of the game. Today, the old oak was basked in the glistening beauty of raindrops. As always, the wonder of nature fascinated me. I stared, wondering how long it would take before they would fall to the ground. I finished dressing and was ready for the day's errands, but decided to take one last look outside at the oak tree. 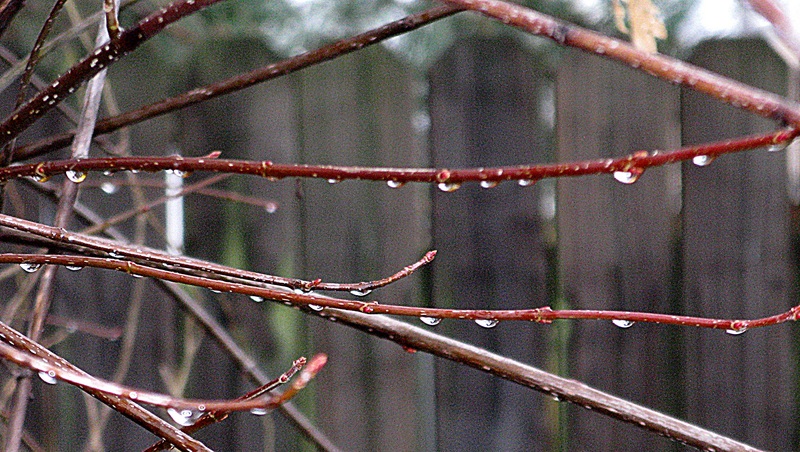 The raindrops were still there, hanging precariously, but there nonetheless. It had been several minutes since I had first seen them on the tree branches. I grabbed my camera and went to take a picture and was so glad that it wasn't too late to capture the beauty that mother nature provides us in various ways even on a cloudy, gloomy day. Raindrops are a lot like life, they both have a beginning and an inevitable end. However one's life can be unique and as significant as a small droplet of rain. It can be unpredictable at times but can be special. They both have a beginning and an end. Just as the raindrops provided much needed moisture, they also provided beauty in it's brief life. How we use our raindrops in this life depends only on each of us as individuals.